During runtime, the DataFile object within E-Prime generates a .txt file known as the E-Recovery text file. At the end of the experiment, this file is converted into a .edat file for use within E-DataAid and E-Merge. By default, these files are written to the same folder/directory that the experiment (.ebs file) is running from. The DataFile directory's default location can be changed for the .edat files that are written. Upon opening of the data file, E-Prime looks at the system E-DataPath environment variable. If specified, all .edat files are written to the location during the running of experiments. This setting overrides the default settings. All data files are written to the environment variable location regardless of what folder they are run from. To restore to the default setting of writing the data file contents in the same directory as the running experiment .ebs file, delete or clear the value of the E-DataPath environment variable. Select the System from the Control Panel. Select the Advanced system settings page. Click the "Environment Variables..." button. Create a E-DataPath environment variable and specify the drive letter and directory of the location where the data files should be written. Consult with your Network Administrator upon choosing the system variable option. If E-DataPath is created under the user section, only experiments run while logged in as the current user are affected. If E-DataPath is created under the system section, all experiments run are affected. Click OK to close and save. The image below shows an example of the E-DataPath environment variables set in a Desktop folder named "Temp." 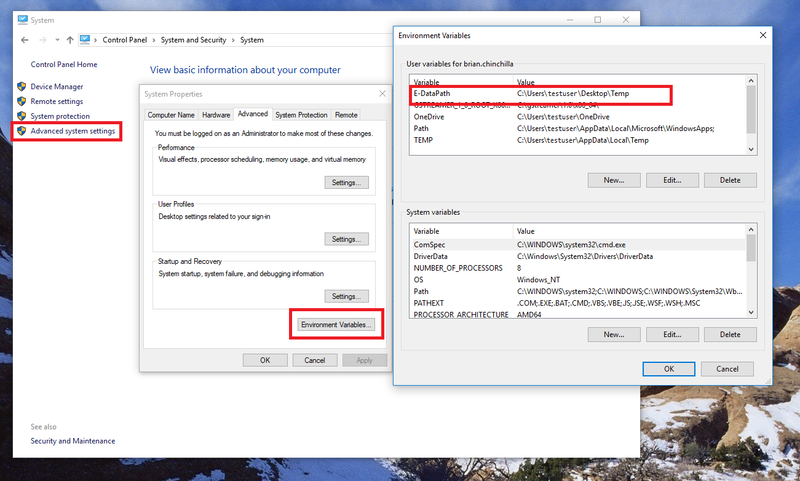 It also shows how to access the environment variables using Windows.